Hello all. It's me, ChichiriAXS and I'm back with another review. It is a Sailor Moon review, a response (more like an addition) to Meiko's review of the Anime. Just as Meiko, I watched Sailor Moon on Cartoon Network. I saw it from the very beginning to the last episode they aired. I will, therefore, take you on a walk on Memory Lane and talk about Sailor Moon's history: The Good, The Not That Bad, and the Unseen. Not all of Sailor Moon had that terrible pattern Meiko mentioned in her review. Actually, the first seasons of Sailor Moon had depth. The first season of Sailor Moon was pretty good. It had much less repetition than the later seasons because it dealed with finding all the Sailor Scouts and defeating Queen Beryl. The second season of Sailor Moon, Sailor Moon R, was great. It could be cut in half. The first half is after the defeat of Queen Beryl, where the Sailor Scouts lose their memories of being warriors. This piece of SMR, like SM, had less repetition than the later series because the Sailor Scouts had to get their memories back. Also, there is a huge romance struggle between Sailor Moon and Tuxedo Mask, because Tuxedo Mask can't remember his love for her. 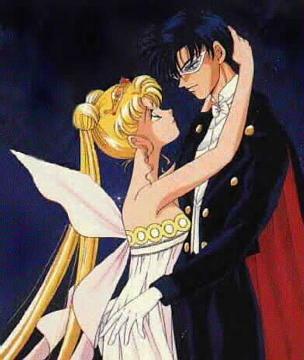 During the battle between the evil force of this time, these two confused lovers and a huge tree (the two lovers aren't really evil, but their confusion leads them into the evil tree's grasp), Tuxedo Mask finally remembers about his feelings for Sailor Moon. Moving on, the second half of SMR was even better than the first half. It first dealed with a group of girls following orders from this guy (whom they all loved). Also, this strange girl named Rini (CN version) appears from the future (Sailor Moon and Tuxedo Mask's future daughter). Anyway, those girls want something from Rini, a crystal. Those girls end up being good and the bad guy is defeated. Only problem, that guy was working for an even stronger guy. Then we are whirled into mayhem as the Scouts go into the future. Long story short, that new guy was being manipulated, and later killed, by a shadowy figure (a wiseman or something like that). Rini and Sailor Moon defeat the shadowy figure and that ends SMR. The next two seasons of Sailor Moon make up the Not That Bad. The first, Sailor Moons S, follows the journey of the 5 Sailor Scouts and 3 new scouts (independent from the other 5), trying to find out who has the Pure Heart Crystals. These would be used to destroy the world. The villain in this is a girl named Hotaru. When she was a girl, her father and her were in a fire. They were trapped, but the father was offered protection from the fire, and he agreed. The downside, his daughter was taken over by an evil spirit that grew stronger throughout the series. It didn't fully control Hotaru, but as it grew stronger, it had more and more control over her. Another problem, Hotaru and Rini became friends. Yet antoher problem, the 3 Scouts wanted Hotaru dead, because she was actually Sailor Saturn, who was rumored the Scout of destruction. Later on, we find out these 3 scouts have the Pure Heart Crystals within them and the spirit inside Hotaru becomes an evil mistress whom Super Sailor Moon and Sailor Saturn (the actual Hotaru) defeat. After the fight, the 3 scouts go away and Hotaru is reborn as a baby. This season seems interesting enough, right? Well, althought it seems interesting, when you add countless filler episodes, this series becomes a bit boring. Overall, its not that bad. The next season, Sailor Moon Super S, is the worst season of SM I've seen. It has to do with Rini and a horse named Pegasus found in dreams. Evil guys want to find the Dream Mirror containing Pegasus to destroy him. There aren't any significant sub-stories or anything like that, which is what hurts the season. Basically, this series is episode after episode of very weird looking monsters (bouncing balls, birds, etc) trying to get the Dream Mirror and failing. This can become very tiresome. If you have some patience, you can get to the good stuff, near the end. Everything is solved here and it is pretty good. But, then again, some may not find it worth the wait. I'm not saying this season was absolutely horrible, but it could've done without all those extra episodes of the same fights. Ok. I haven't really gotten around to see Sailor Moon Stars. Therefore, I won't even try to criticize it. It's supposed to be good, but Cartoon Network has never aired it, and the last SM series disillusioned me to a point where I really don't care. There you have it, my review on Sailor Moon. It had some really exciting, interesting points. It had some really boring, tedious, repetetive points. It had some points in between, and even some I haven't seen. (Look at that, I made a rhyme without even trying) Anyway, let's get down to it. Do I recommend it? Yes. The first two seasons were really good and the third wasn't that bad. The fourth season was kinda boring, but it could've been worst. The fifth I didn't see. Overall, it was an alright Anime. I've seen better, but I've seen much worst. Nevertheless, one must give it credit for being one of the series that opened the doors of Manga and Anime to North America. Meiko's CommentsI just want to thank ChichiriAXS for this review. This is what I want this reveiw section to be like.. people giving thier own opinons on animes... I'ts been so long since someone has sent me a review. send me some! !